The Butterflies Junior Garden Club and the Ladybug Garden Club decorated beautiful trees for the Garst Museum’s annual Holiday Open House, 205 North Broadway, Sunday, December 2 from 1-4 pm. The public is cordially invited to attend and witness all the Christmas decorations from various organizations. Special attractions will be an afternoon of seasonal music, light refreshments, and the beautiful decorations. 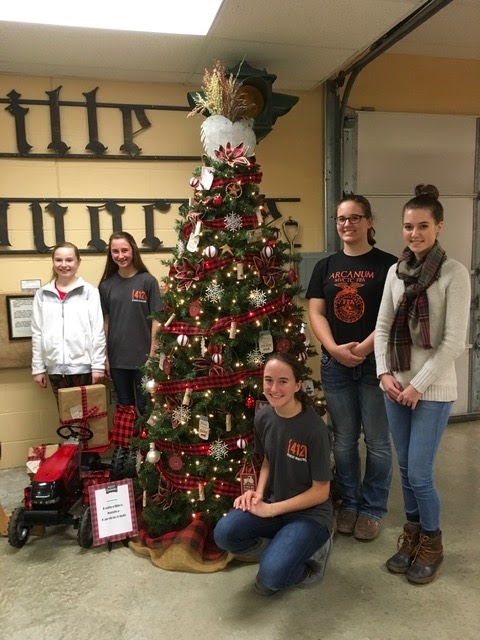 The Butterflies Junior Garden Club decorated a “Christmas on the Farm” tree with the help of Alivia Addis, Saige Fellers, Hannah Smith, Kate Rehmert and seated Brianna Fellers. Assisting was Kim Cromwell . The club selected the buffalo plaid colors of red and black to highlight the many ornaments made by Club members. Ornaments read ‘if you ate today, thank a farmer’ and ‘Christmas is better on a farm’. Snow ball ornaments were made using styrofoam balls wrapped in the buffalo plaid ribbon. Burlap and plaid tulle served as the tree skirt. The tree topper was a 1942 metal chicken made by Frank Sheffer. Special interest was a Case toy tractor displayed from the Smith family. The Ladybug Garden Club decorating a tree at the Garst Museum were Amy Erisman, Becky Collins, chairperson Shirley Linder, Amy Addis and seated Mariana Ramos. The decorations reflected life on a farm using bales of straw, vegetables, gardening supplies, grains, fake animals and even a mouse.